This installation will come down on November 7, 2018. Don't miss it! SAN FRANCISCO – The San Francisco Arts Commission, with funding from the Office of Economic and Workforce Development and in partnership with the Recreation and Park Department, will mount an ambitious installation, Invisible Man and the Masque of Blackness, by celebrated British Trinidadian artist Zak Ové. The artist’s first exhibition of this important body of work in the United States, the installation will be on view from June to early November 2018. Invisible Man and the Masque of Blackness was originally conceived for the grounds of the historic Somerset House in London, which shares a similar government context and architectural characteristics of San Francisco’s Civic Center. The installation consists of 40, 6.5-foot identical black figurative sculptures, each approximately 300 lbs, that stand upright with the figures holding their “hands up” in a precise formation that aligns with the symmetry of the surrounding architecture. The Arts Commission received funding from the Office of Economic and Workforce Development to bring temporary public art to Civic Center Plaza as part of the Civic Center Commons Initiative. Civic Center Commons is a strategic effort led by the City of San Francisco and many partners to foster a sense of community in the heart of the City’s central public spaces and to create a connected, inclusive “commons” for people who live, work and visit the area. The Civic Center Commons (“the Commons”) is a collective name for the UN Plaza, Civic Center Plaza, and Fulton Street between the Asian Art Museum and the San Francisco Main Public Library. Neighbors, community organizations and cultural institutions are working with City agencies and those who frequent these spaces to bring interactive art installations and play structures; new stewardship approach; more regular activities and events along with food and drink options; and innovative workforce development partnerships. Ové created Invisible Man and the Masque of Blackness in direct reference to a play performed at Somerset House in 1605 titled The Masque of Blackness, which was performed by Anne of Denmark and members of her court who appeared in blackface. The play, according to the artist, “was reflective of the societal shift towards a preference for lighter skin in the early 17th century.” The title of the work alludes to Ralph Ellison’s acclaimed novel Invisible Man (1952), a pioneering reflection on racism in America told through the eyes of an African American man whose skin color renders him invisible. While the “hands up” gesture of the figures was derived from a traditional form, it resonates with current tensions of the political “don’t shoot” symbolism employed by the Black Lives Matter movement. 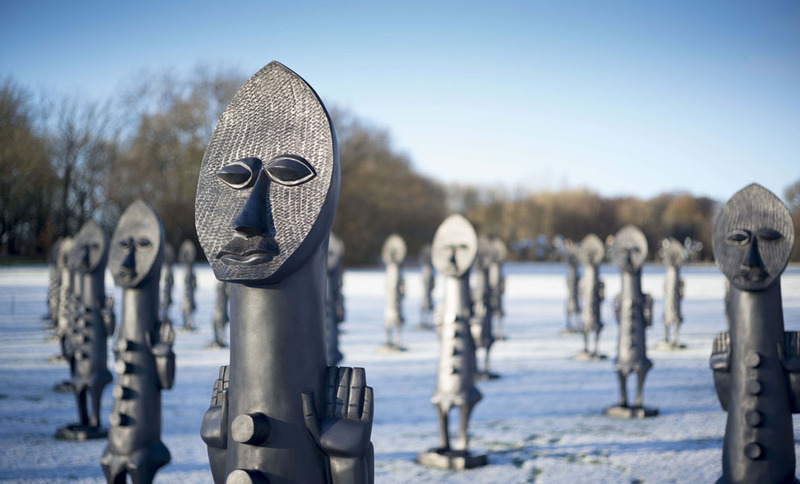 Fabricated from resin and graphite, the sculptures reference a traditional African figure given to the artist by his father, renowned filmmaker Horace Ové, when he was a young child. For Ové, the ways in which this original sculpture has taken on new layers of meaning through time and has been adapted in his work is a metaphor for the complexities of personal identity.